A paranoid cab driver named Jerry (starred by Mel Gibson) tries to convince Justice Department attorney Alice Sutton (Julia Roberts) that NASA wants to kill the president using a secret weapon capable of causing earthquakes. Soon, Jerry and Alice find themselves in the middle of a melee between several secret government agencies, one of them led by one Dr Jonas (Patrick Stewart). Well, at least Jerry is unionized! 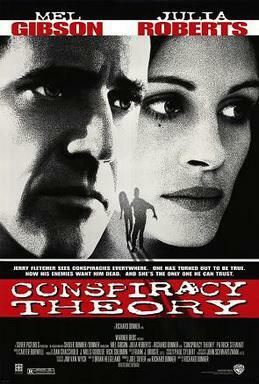 "Conspiracy Theory" is a movie saved only by the competent and rightly famous actors. It really only deserves two stars, but since I managed to get through it due to Gibson, Roberts and Stewart, I kindly award it three. But don't say I didn't warn you!